WDC is often asked if it is ok to swim with whales and dolphins in the wild. Why is it an activity we actively discourage? Our response is always the same: We totally get that people love the idea of being in the water with these beautiful creatures. However the reality is that it can be a really intrusive and stressful experience for the whales or dolphins targeted so we strongly discourage it and instead, advise people to go whale watching with a responsible operator, as a wonderful alternative that can benefit people and whales and dolphins. We are not alone. Most countries with whale watch regulations either prohibit or strongly advise against swim-with, due to concerns about the safety and welfare of both swimmers and whales and dolphins. Swim-tour operators need to drop clients in the water close to whales or dolphins, increasing the likelihood of their everyday life and routine being disturbed, or being struck by boats. These interruptions can be particularly harmful to mothers with calves. Over time, they may even have effects on the health and reproductive success of the population. When their lives are interrupted by snorkellers, whales or dolphins can spend less time socializing, resting or being active ; they might change direction or dive to avoid swim tour boats. They might even abandon their usual habitat in favour of quieter areas. It is easy for us to be excited at the idea of being in the water with whales or dolphins, but we forget that we are entering their realm as uninvited guests and our presence may not always be welcome. Imagine sitting in your dining room. It is Sunday lunchtime and the table is heaped with food. Your dad is serving roast potatoes whilst your sister is helping her two year-old son eat his lunch. Suddenly, a coach squeals to a halt outside your front door and thirty people rush into your house, excitedly chatting and taking photographs from all angles. Eating is forgotten as children wail with anxiety, unsure about what is going on. Hard to cope with once, but what if that becomes your daily reality? ■ Many encounters take place in deep waters with strong currents or waves, which can be alarming if you are not a confident swimmer. WDC campaigns against the keeping of all whales or dolphins in captivity, including sea pens. Why? Dolphins are wild creatures and unpredictable, even when well trained. Swimmers have been known to incur bruises, scratches, abrasions, bites and even broken bones. 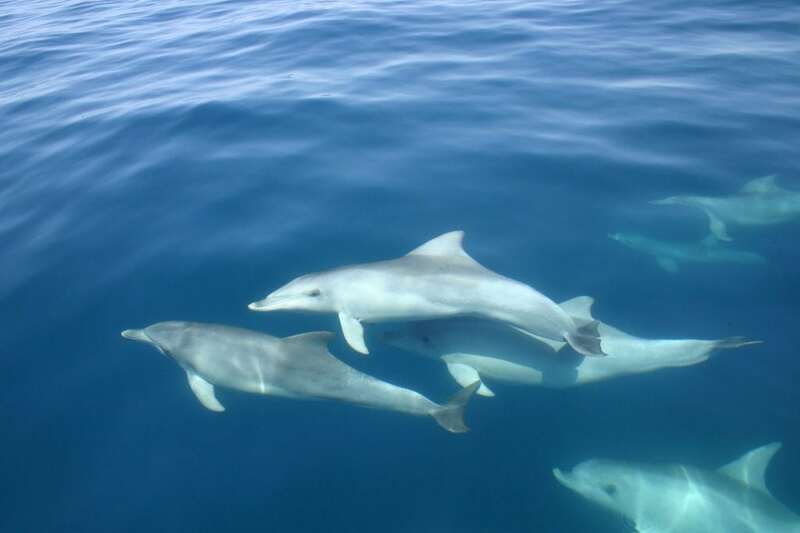 Disease transmission is a serious concern, as dolphins carry diseases that can be transmitted to humans and vice versa. Many facilities keep the dolphins in enclosures on the coast, and in the Caribbean hurricanes have had serious after-effects. Dolphins in some facilities face injury from falling debris or being washed out to sea. Both land-based pools and sea pens close to shore may contain only very shallow water, which can get too hot in the sun. Resorts may also contain high pollution levels, increasing the risk of illness and even death. Some dolphin sea pens may even harm the local marine environment - a result of dolphin waste contributing to excessive algal growth. In captivity, dolphins cannot escape from human swimmers when they do not want to interact with them. Interactions with swimmers can lead to heightened stress and anxiety, which is often managed through medication in captivity. Dolphins are at risk of collisions with swimmers and other dolphins; and fingernails and jewellery can damage their delicate skin. Dolphins may have come from other captive facilities or been taken from the wild from their families. Dolphin Assisted Therapy, or DAT, is an increasingly popular Animal Assisted Therapy made available through a growing number of programmes around the world and marketed as offering a cure or respite from human illness or disability. However, there is no scientific evidence to prove that the therapy is effective and it is not recommended as a treatment for people with autism.